This five-week film series is dedicated to classics of wuxia, China’s heroic stories of martial arts and swordplay, and accompanies China Institute’s exhibition Art in a Time of Chaos: Masterworks from Six Dynasties China, 3rd – 6th Centuries. Directed by guiding lights of Chinese cinema — King Hu, Zhang Yimou, John Woo, Feng Xiaogang, and Tsui Hark – each film is set in a different dynastic period, during a time of chaos marked by immense change. The screenings will be introduced by a distinguished scholar and will feature accompanying contextual materials written by series curator Nancy Jervis. Introduced by Raymond Tsang, Doctoral Candidate in Cinema Studies at New York University. 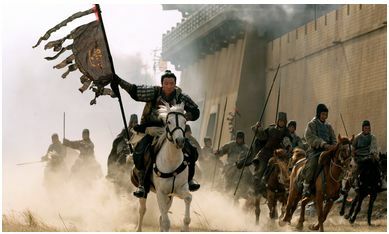 John Woo’s Red Cliff was inspired by the Battle of Red Cliffs (208–209 CE), which marked the last days of China’s culturally seminal Han dynasty and the transition to the Three Kingdoms Period. Tickets are only $5 per screening! Free for members! No user commented in " Red Cliff Film Screening "